We ended the book of Matthew declaring "Jesus is Lord!" and here in the beginning of Mark we see declared "You are the Holy one of God!" (1:23). This declaration is not made by a follower and believer of Jesus, it is made by an evil spirit possessing a man in the synagogue. How can this be? If by declaring Jesus as Lord, we are saved, how is it that an evil spirit can recognise Jesus, name him and yet still remain evil? This is why relationship is so important. To say you know Jesus as your saviour and Lord, are the words that save you but, only if you accept them into your heart as truth, trusting in Jesus and giving your life over to God. Philippians 2:11 says that we confess who Jesus is to glorify God. These are the things that are growing in you as you seek to grow your relationship with Jesus, he has placed his Holy Spirit in you to achieve these heart changes, that are not possible without him. We need to be aware of the difference between the characteristics of a person and the fruit of the Spirit. Anyone can be loving, peaceable, patient, good, kind, faithful, gentle and self-controlled, but no-one can display them to the glory of God without the Holy Spirit. One of the reasons that Jesus demands that the evil spirit be quiet is association. Jesus does not want testimony of who he is from someone who is not testifying with their life. Paul has the same reaction to a possessed slave girl in Acts 16. If we are declaring to be Christians and to know a loving God, but are not displaying loving behaviour, how does that testify to God? As you deepen your relationship with Jesus the fruit of the Spirit will transform you, by the Spirit. In relationship our heart changes to lean in toward the one we are in relationship with, and we imitate their behaviour not just as words but as action in our lives. Saying Jesus is Lord and believing it in our hearts brings about a change that means you cannot help but serve in the way Jesus did. In Mark 1:29-31, Jesus heals Simon's mother-in-law of a fever, she was healed so completely that she immediately got up and began to wait on them. Jesus healed her, he didn't ask her to serve, she is compelled, maybe out of gratitude. I know part of my faith is serving God out of the gratitude in my heart for the healing he has done. Do you need to do more than say you know Jesus? Are you declaring his name but not God's glory? Would someone know you are in a relationship with Jesus without you telling them? Lord, thank you that you don't just know me as the person I let others see, but you know my heart and my motives. Thank you that you love me too much to let me stay the same and are continuing to grow my Spirit to glorify you. Help me to bring my words and actions together as one. 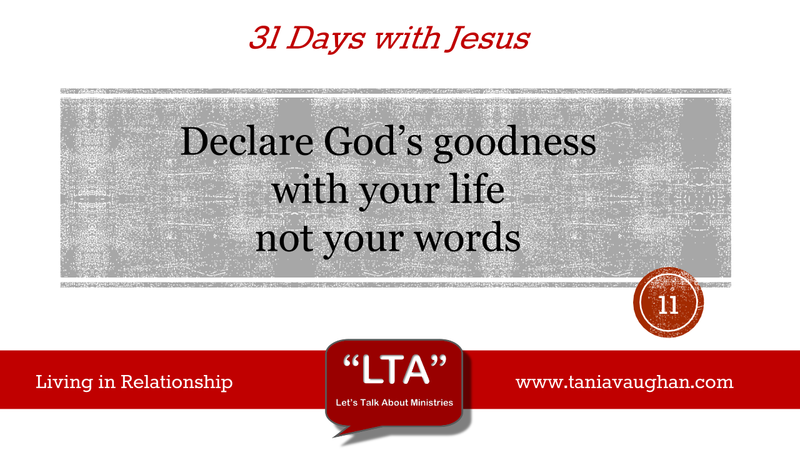 Lord, I want to declare your name in the way that I live, not just with the words of my mouth. Before I became a Christian I suppose I was just a law abiding member of society with a sense of good and bad - like most people I guess. But I knew in my heart that I was angry, bitter and alone with no direction or purpose; I tried to fill the void with worldly stuff but the hole was never filled - Until I met with friends who introduced me to Christ and a new way. They were steadfast in their faith enough to share it with me - Praise God! I now have the same security in faith to pass on the good news. I now display the fruits of the spirit and pray that they develop as I walk with JC - those issues I had before I was a Christian are still there in my personality but I now have the peace, love, faithfulness and self-control etc to show God's grace through my witness - it is this relationship that God craves not some church-face loyality card where if you get enough stamps you get free ride to heaven.